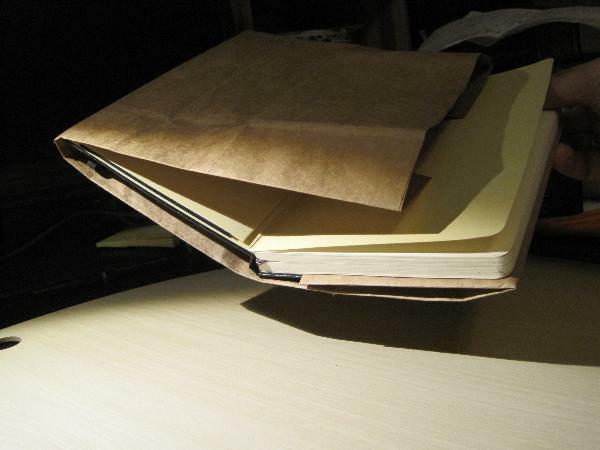 Or maybe raw brown paper is DIY-chic. 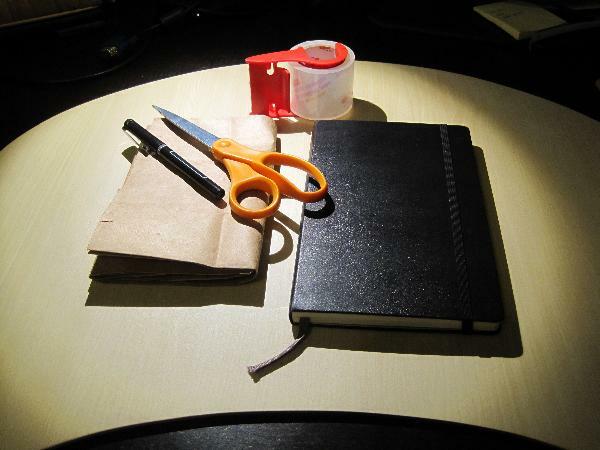 Maybe you can’t tell your moleskine from everybody else’s. 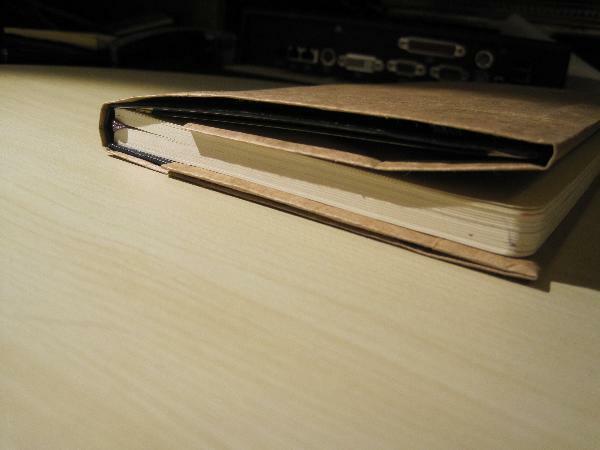 Maybe your notebook already takes enough abuse. 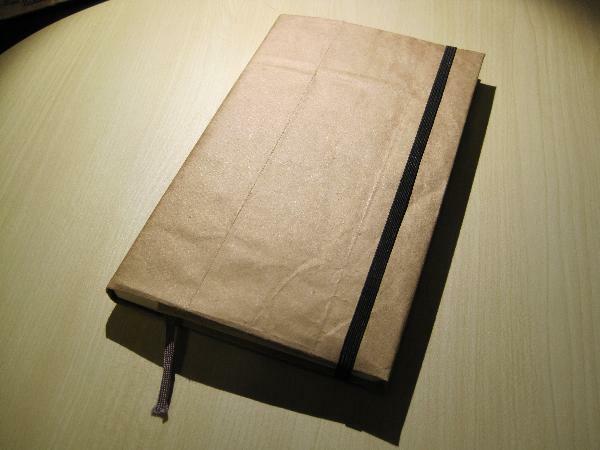 Maybe a brown paper cover is a good idea. Whatever. I got the idea for this about a year ago, and did it just to see whether I could. 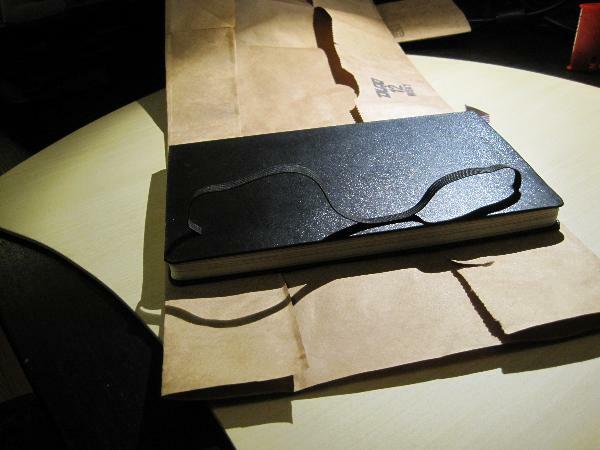 (The moleskine elastic, as you’ll see, makes this a little trickier than your typical book covering.) I’ve done it several times, because I kind of like it. I finally googled today to see whether anyone else had instructions up for this, and was surprised I couldn’t find any. So here we go! 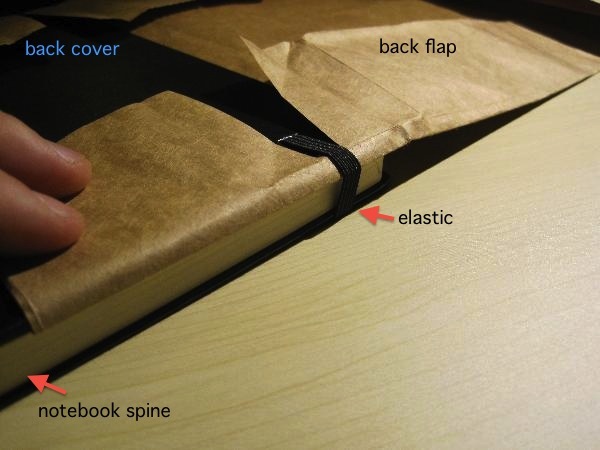 Your uncovered moleskine notebook. I’m using a large, but I’ve also done this with small ones. 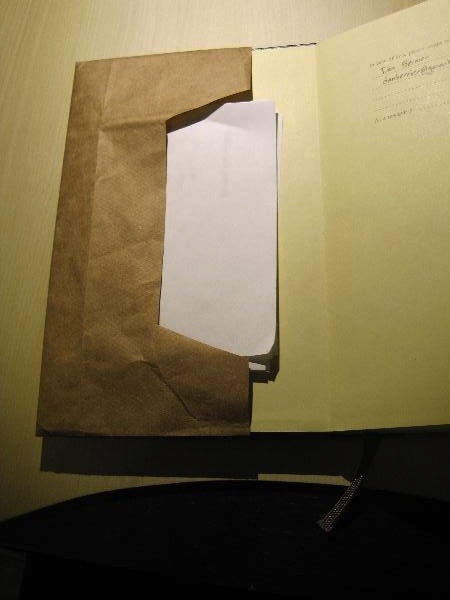 A brown paper bag. For the large notebook, I’m using a bag that’s 7 1/16 x 4 1/2 x 13 3/4; for small notebooks, you can use something as small as a lunch bag. This part is just like the book coverings you maybe made in school. 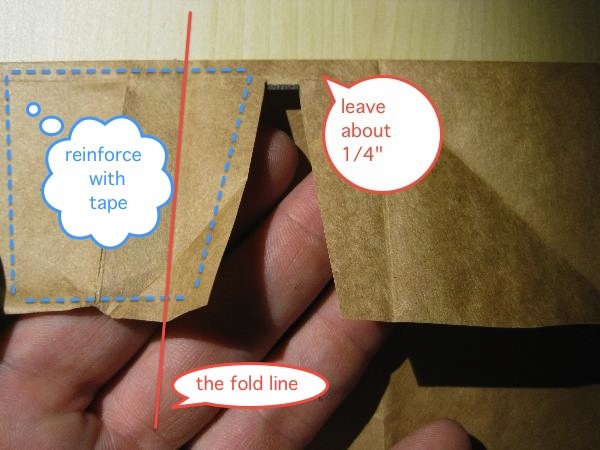 Cut down the seam of the paper bag, and cut off the bottom, so you have a large sheet of brown paper. 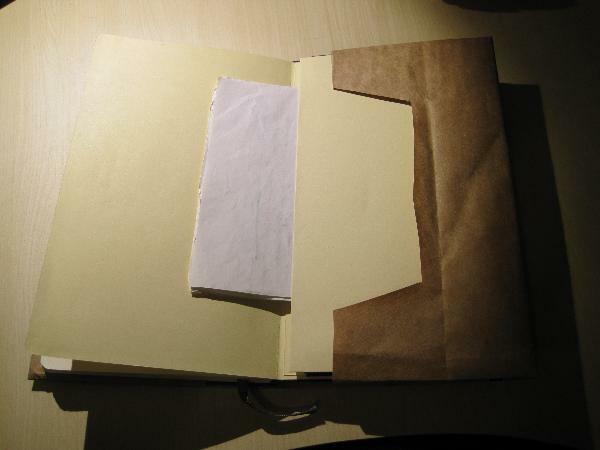 Fold the top and bottom edges of the paper down, so the book is the same height as the paper. That elastic is getting in the way, right? 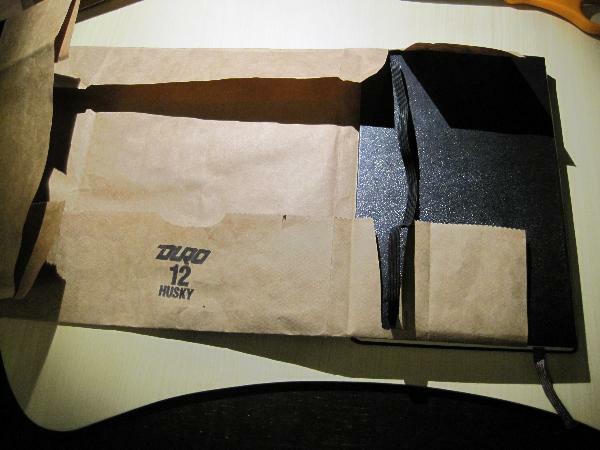 Unwrap the book a bit, we’re gonna use the scissors – but read through this part all the way before you start cutting. 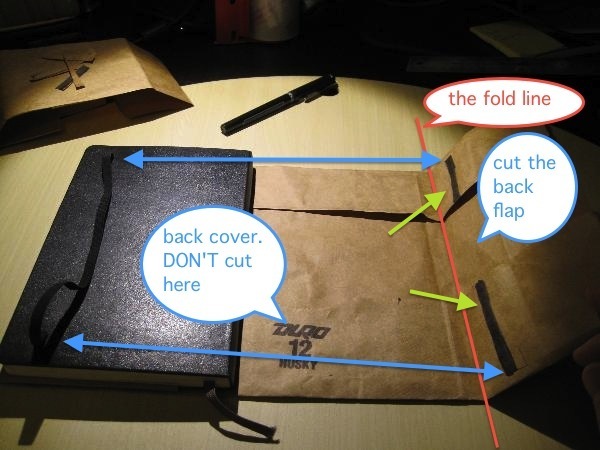 Make sure you cut on the back flap, not on the back cover. 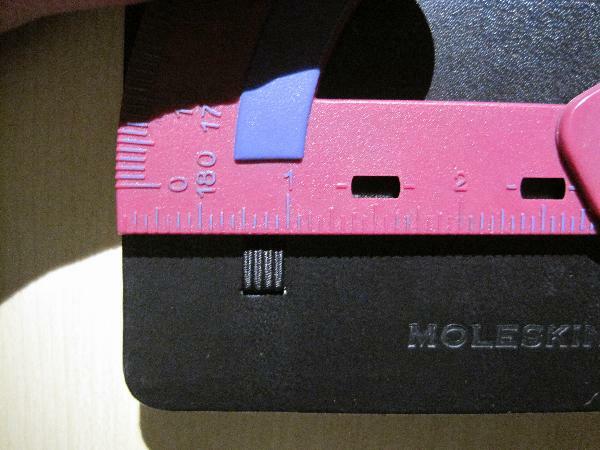 For some reason, I always screw this up – I want to cut the back cover. Don’t do that. Cut the back flap. 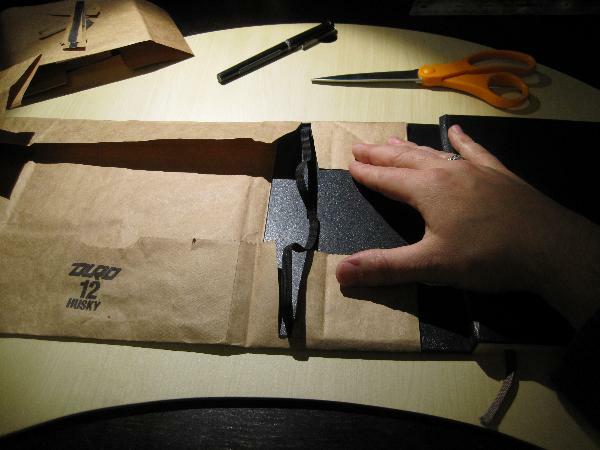 You don’t have to reinforce this section with packing tape, but I’d recommend it – with the larger notebook, the elastic jerks this part of the cover around a lot, and the packing tape will make it last a lot longer. Don’t forget to do the bottom half, too.